Researchers identify and correct premature aging in diseased cells. Scientists from the Institut Pasteur, CNRS, Institut Gustave Roussy and CEA, have succeeded in restoring normal activity in cells isolated from patients with the premature aging disease Cockayne syndrome. They have uncovered the role played in these cells by an enzyme, the HTRA3 protease. The team state that this enzyme is overexpressed in Cockayne syndrome patient cells, and leads to mitochondrial defects, which in turn play a crucial role in the appearance of symptoms leading to aging in affected children. The current study describes one of the hitherto unknown mechanisms responsible for premature aging which could also shed light on the normal aging process. The opensource study is published in the journal PNAS Plus. The team state that rare genetic diseases cause accelerated premature aging. To date, there is no treatment for these pathologies. Understanding the causes of premature aging diseases may also help elucidating the process of normal aging. One such disease, Cockayne syndrome (CS), has an incidence of about 2.5 per million births and, in its most severe form, is associated with a life span of less than seven years. Children with Cockayne syndrome show marked signs of premature aging, such as loss of weight, hair, hearing and sight, as well as facial deformation and neurodegeneration. Previous studies have shown that Cockayne syndrome is caused by mutations in either of two genes involved in the repair of DNA damage induced by ultraviolet (UV) rays. CS patients are hypersensitive to sunlight and burn easily. For decades it was believed that the premature aging process associated with this disease was essentially caused by DNA repair deficiency. The current study compared cells from CS patients and from patients with another related syndrome causing only UV hypersensitivity. The data findings showed that the defects in CS cells are actually due to excessive production of a protease (HTRA3), and induced by oxidative cell stress. In CS cells, HTRA3 degrades a key component of the machinery responsible for DNA replication in mitochondria, the cellular powerhouses, thereby affecting mitochondrial activity. Until now, neurodegeneration and aging have largely been attributed to the damage inflicted on cells by mitochondrial free radicals, state the researchers. The current study shows that free radicals also activate the expression of a protein known as HTRA3, which is particularly damaging to mitochondria. This onslaught on the mitochondrial core is a key factor in the degeneration of cells in patients suffering from premature aging. By using an HTRA3 inhibitor and a broad-spectrum antioxidant to capture free radicals, the scientists succeeded in restoring normal levels of this protease. They were accordingly able to restore mitochondrial function in CS patients. The team surmise that these defective mechanisms may also occur, but at a slower rate, in healthy cells, leading to physiological aging. The development of therapeutic strategies targeting premature aging diseases could therefore open new research possibilities in terms of preventive therapies for the pathologies associated with normal aging they conclude. The Institut Pasteur, CNRS, CEA and IGR have filed a patent application for methods of diagnosing and treating premature aging using the protease HTRA3. 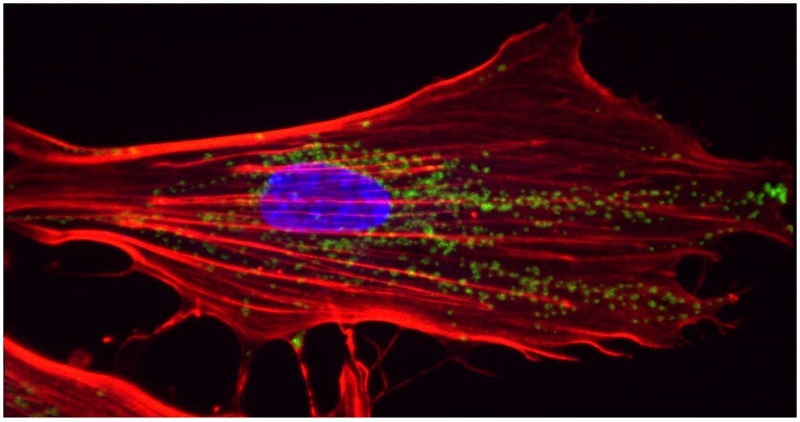 3D reconstruction of a primary fibroblast from the skin of a patient with Cockayne syndrome: mitochondria are shown in green and the nucleus in blue. Credit: Institut Pasteur.